West Indies first innings 145 without any loss (Chris Gayle 85*, Kieran Powell 58*) trail New Zealand first innings 351 (Martin Guptill 97, Daniel Flynn 45, Sunil Narine 5-132) by 206 runs. Sunil Narine bowled excellently and achieved his first five wickets haul in a Test vs. New Zealand whereas Chris Gayle and Kieran Powell gave a solid start. New Zealand was bowled out in the first innings for 351 runs in 129.1 overs and West Indies gave a solid reply by smashing 145 runs with all 10 wickets in hand at the close of day two. 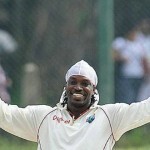 The second day’s play came to an end on Thursday, July 26, 2012, at Sir Vivian Richards Stadium, North Sound, Antigua. Earlier, the Black Caps started their first innings on the day two at 232 for the loss of four wickets after consuming 90 overs. Neil Wagner initiated the day at four runs and Kane Williamson was at the other end with a couple. The Windies got an early breakthrough as Wagner was gone without adding any run to his overnight score and Dean Brownlie replaced him in the centre. Williamson tasted the first four of the day in the 95th over and the Caribbean bowlers came back strongly while bowling three consecutive maiden overs. The batsmen found it hard to score the runs and Brownlie managed just one run on the 32 balls he faced and got a four on the next ball. The sixth wicket partnership produced 40 runs when Kane Williamson was clean bowled by Kemar Roach on the first ball of the 110th over. Dean Brownlie departed after the addition of eight runs to the total for 23 and a little contribution was made by the tail end batsmen. Doug Bracewell played a hurried knock of 39 off 31 balls with 2 sixes and 5 fours as the visitor’s innings was rolled back for 351 after playing 129.1 overs. 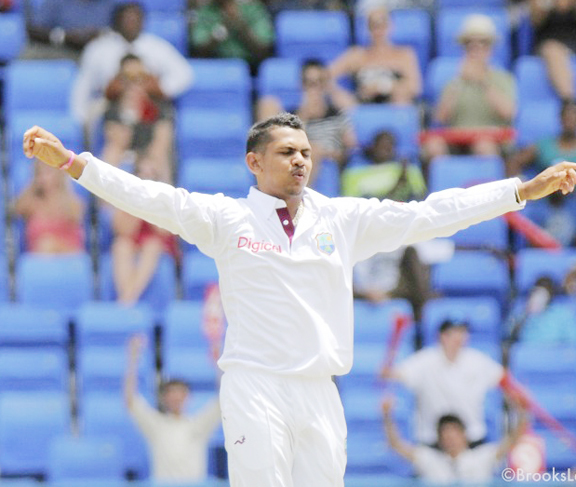 Sunil Narine was the highest wicket taker by grabbing five which was his first five wickets haul in his only second Test. Ravi Rampaul and Kemar Roach ended up with two wickets each whereas Darren Sammy chipped in with one. Chris Gayle made a comeback in the West Indies Test side after a lapse of almost 18 months and opened the innings with Kieran Powell. Gayle started off with a bang by dispatching four consecutive fours in the first over which was bowled by Chris Martin. Powell opened up his account with a single and preferred to secure his end. Gayle accumulated 10 runs in the eighth over with a couple of fours and Powell joined him with the same result in the following over. Chris Gayle got a life at 36 runs when he was dropped by Flynn off Doug Bracewell on the first ball of the 10th over. The batsman celebrated the chance with three fours in the next over and completed his fifty in the 13th over. Kieran Powell hit two back to back fours in the 16th over, made his presence felt in the park and the first hundred of the innings was attained in the 21st over. The duo continued stealing the runs with the assistance of boundaries whenever available at a reasonable pace. Powell achieved his third Test half century on the fourth ball of the 37th over with a four at deep square leg and Gayle kept on cruising from the other end. Both batsmen slowed down in the dying overs of the day and kept their wickets intact at stumps on day two. 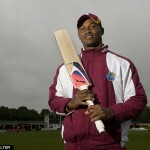 Chris Gayle hammered 85 runs off 124 balls with one six and 12 fours whereas Kieran Powell was unbeaten for 58 off 164 deliveries with 10 fours. West Indies are placed well after reaching 145 without losing any wicket and anticipate that the two not out batsmen will stabilise their position on the third day.